From our school's weekly update . . .
To resolve our past requires knowledge,To forge our future we need courage, To experience the present we must develop dedication. Our thinking needs riddles to wake up, Our feeling needs pain to mature, Our willing needs resistance To become strong. Steph & I have made a rather big (at least for us, anyway) and committed decision recently to be the best yogis we can be. Primarily this means forgoing other intentional exercise in favor of hitting our yoga mats six days a week. Yep - six. This is how the yogis do it. We are in our 3rd (or is it 4th???) week and there are definite yet subtle results. My body has a constant fatigue - the good kind. The kind that makes you relish pulling the covers up at night like you are sinking into a haven of goodness. (I do really love my bed). My muscles are sore, but not too sore. I feel strong. I feel light. I feel more present. And when I don't feel light and present we practice anyway - having what we call a "moving through wet cement" day. My mat is a place of calm, breath and moving meditation. I LOVE it. Here's how it goes - Steph or I arrive at each other's door between 5:00 and 5:30. We let each other know how wretched of an hour it is to be up and that we are tired. We take inventory of all other complaints and joys. We light the incense to make our room feel more like the studio. We dim lights. We unroll our mats. We walk to the top. We look at each other, smirk, and say a half-hearted "om" - which is always good for a chuckle. And then we move. Sometimes we are silent minus breathing for an hour. Sometimes we chatter the whole time. It doesn't matter - we're on our mats. Thank you, lovely and beautiful Steph, for time on the mat and being present with me. Om shanti, namaste. Two days ago I am in the car with Quinton after retrieving him from school. He tells me, very confidently and happily, "Mommy you can leave me all by myself now because God is with me ALL the time." Hmm. Just when I thought rock-n-roll church was a good thing. Raising children puts you on a perpetual mountainous ride of elation and heartbreak. Dan & I have said that the flux between these two emotions which cycles every week or two with the "typical" child happens on a daily basis for us and Elliot. The lows are a bit lower, and the highs a bit higher. Today was no exception, in fact the ride was on and we were in the fast car. Today we had a friend's birthday party for school. Elliot's dearest friend, in fact. Anyone who knows anything about the autism spectrum can easily imagine why a child's birthday party could be a nightmare for a quirky kiddo. Heightened emotions, sensory blasting, social chaos and the stress of anticipation name only a few reasons. The day started with ice-skating. My boys' third day on the ice. And there were hockey sticks and pucks involved. I felt my gut tighten. Elliot stunned me. He grabbed a stick and off he went, chasing his friends. He was so committed to being socially involved with his friends that he worked with heart-wrenching effort at skating to keep up with the faster few. I couldn't believe his progress, and was elated with his connectedness to his friends (Arrive at Mount Elation Peak 1). However, there were two rounds of sad quiet tears in the first 20 minutes as he realized he couldn't keep up like he wanted (Plunge to Heartbreak Valley 1). 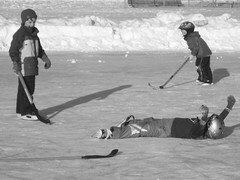 I kept encouraging him, and I'll be darned if he just didn't keep himself going......all the way through to game's end, participating in the "huddles" and enjoying the thrill of the single goal the kids scored against the grown-ups (Climb to Elation Peak 2). Off we go then to the rec center for pizza, cake and presents. Pizza is opened, all with tomato sauce. Elliot doesn't really care for tomato sauce. And he's been such a good eater lately (the boy does curry and mussels for heaven's sake!) that we get him another kind of sauce when we order pizza. More quiet tears and anxiety over lunch. On a typical day he would ride this out much better, but not today. (Ride back on down this time to Valley of Exasperation). He pulls it together fairly quickly, decides to not try pizza, and sits down with his friends and drinks his apple cider. After lunch the boys all run around and play. It's encouraging to see Elliot enjoying himself again, his friends enjoying him and all their silliness - except for the one moment where we caught them all trying to stick their heads in the rubbish bin. (Moving back on up to the Peak of Parenting Warm Fuzzies). Presents are opened, and then the the announcement is made that the "thank you presents" for the guests will be coming in the mail this week. Now I do not have an ungrateful, indulged child. But this sent Elliot over the edge. And while all the children were a bit disappointed, Elliot's poor brain could not regulate it at this point at all. (Crash to Valley of Despair and Heartbreak and end ride there for the day). We ended up going outside for a walk, and hanging out the two of us until it was time to go. He just couldn't recover. No tantrum - just an overwhelming disappointment and inability to cope. And while I could understand where this was coming from and be compassionate, I certainly couldn't tolerate the behavior. I mean, seriously, you can't cry and be upset over not getting a present at another person's party. Dan took the Q-Man to rock-n-roll church later (a topic for another time), and Elliot & I had a quiet evening together of reading, music and reflecting on the day. Despite the intensity of his day, he's eager to return to the hockey ice next weekend. We wrote his friend a brief note for tomorrow, apologizing for his sad end to the party and thanking him for a fun time and the invitation. We talked about autism again and how sometimes it makes things extra hard. I hoped to help him understand his day without feeling bad about himself. I think together we succeeded. I would give anything for Elliot's life to be a bit easier for him, but I'm not complaining. I've got an awesome healthy boy. Two of them, in fact. Make that three if you throw in the 40 year old. Autism can try to beat me up any old day. But maybe a slower car next time, please. Well here I sit, a quiet house, taking what I call a "Mommy's Day Off." I have not lifted a finger to do anything but for myself today, and in a few moments I will join Steph for yoga. The holiday busy-ness, while wonderful, sent me a bit energy negative. My fab husband has learned to rise to the occasion when I declare the need for a break, and has embraced it today. The children delivered me breakfast in bed, complete with the fixin's for my coffee to stir up myself, as I like to have it "just so." I was stunned and savored every bite, sip and extra moment in bed. Sigh. They make me nuts but oh how I love my men. The holidays were cozy-good, initiated by magical Wisconsin Christmas snow and ending with a thud with Quinton's ear infection. But we are forgetting that portion as all the time in between was lovely, lovely, lovely. We relaxed at Grammy & Papoo's, had movie outings with cousins, and enjoyed more than a few jolly moments at the Mickelson House of Merriment (my new name for my sister's house). A new year has arrived, with all the uncertainty of the current economic conditions but also with the memories of an incredible 2008. I have friends to treasure on both sides of the Atlantic, a school in which I am thrilled each day to send my children, good health and a family bursting with love. I have watched my autistic son work through the anxiety-ridden beginnings of 1st grade and arrive to the middle of his journey there with friends, joy, personal insight and confidence. I have watched my four year old exert his independence with astonishing energy, charm and success. Their latest accomplishment - ice skating. I was filled with that "taking first steps" mommy pride as I watched them both work, work, work for a whole hour on their new skates. I sat back with quiet tears and admired Elliot as he skated off with his friend Leo, chatting and playing games while he fell, got up, fell and got up again. I wonder with growing curiosity what 2009 will bring. Will I start working outside the home? Will Steph & I become six-days-a-week yoga practitioners? Will Quinton finally get stitches? Will Dan find the adventure he craves? Will Elliot write his own musical? We'll see......yes, we'll see.